Dream Deferred | Leonard St: Street art – who are the real vandals? 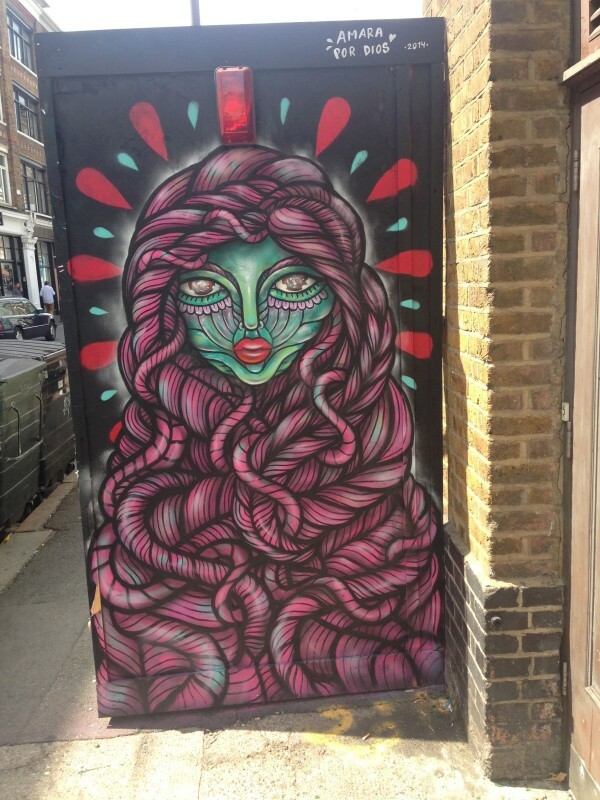 Leonard St: Street art – who are the real vandals? These are the famous words of Russian artist, actor and poet Vladimir Mayakovsky. That has become a reality in a small car park in Leonard Street east London. You won’t be surprised to learn that it is not filled with the works of Mayakovsky, El Lissitzky or Alexander Rodchenko, but you can find the works of Pow Wow, Run, Faith 47, Mysterious Al, Stik, Roa and many more. These are large works of art by some of the best contemporary street artists. They are accessible to all, free to look at and nobody owns them. But now the developers and construction workers are moving in, the wrecking ball is going to work and the vandalism will begin. 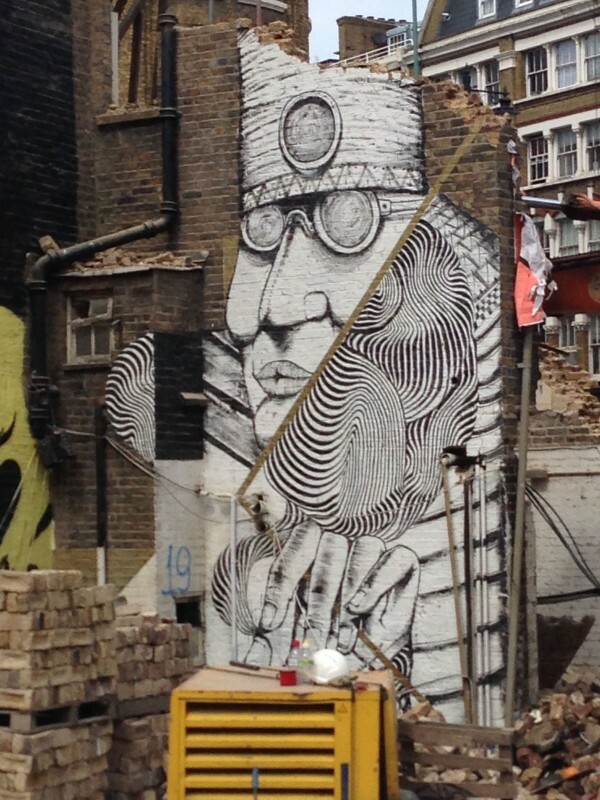 In two weeks time one of the great sites for London street art will be no more. Can you imagine demolition teams smashing up “The Sun” in Berkeley Square, the “IFO” outside Kings Cross or any of Antony Gormley’s works dotted around the country? Of course not – it would rightly be described as cultural vandalism. These works are all considered to be “valuable” and therefore works of great art. The people who run and more importantly own our cities don’t understand street art because it says nothing about their lives and more importantly they think nothing has the right to exist unless it can make a profit. Leonard Street means nothing to these people, they don’t understand it and most importantly they don’t own it. So they are going to destroy it. But that doesn’t mean they always ignore it. Ever since the rise of Banksy, Basquiat and Keith Haring the art world has tried to take control of street art, commodify it and sell it back to us. What was once free and for all to see is now sold for thousands of pounds and is hidden away in private collections. But when artists put their work up on our city walls, it is art in its purist form, nobody owns it, nobody is put off by the price of admission, there is no elitism or hype. Hopefully all that is there is beautiful and engaging works for all who care to see. I am not a romantic, I fully understand the dynamics of the “street art” business, I understand that some street artists put their work out on the streets in order to get recognised and in turn sell their smaller works for large amounts of money. But I love the fact that in some of the poorer neighbourhoods of London, New York, Berlin, Rio and Paris you can see great works of art. You may not like the works that I have posted up. That is a question of taste, but I don’t think it can be pushed away as pop art or crude. Take the piece by the Swedish artist Amara Por Dios. This beautiful piece is painted on a wooden temporary hoarding, its vivid colours and intricate patterns are clearly influenced by Frida Kahlo, Diego Rivera and Aztec culture but at the same time there is a modern twist both in the aesthetic of her work and the materials she uses. Again in my opinion, Stik creates more movement and emotion with his few simple lines than most artists create with a thousand brush strokes. It depresses me that one of my favourite sites is being demolished. But I also smile because street art is here to stay. They can buy it up, paint over it, pull it down, but there are always going to be young and new artists who are going to find new walls and new methods to display their work. I don’t agree with this analysis. These artworks and the hipsters that make them have pushed house and rent prices through the roof in Hackney which forced me to move out. Not just Hackney – the artist who draws the giant hairy rodent (the style of which I kind quite pleasing) has also drawn one over the gentrified patch of Peckham. So the Mayakovsky quote about our art in our streets is not the art of the ordinary people but of the middle classes, now saying ‘we own this patch’ with ‘tags’ of these artists that are pale imitations graffiti tag artists but ironically end up symbols of social exclusion of poor black Hackney residents of neighbouring council estates. When you have massive inequality of two separate worlds – the exclusive art world next to poverty – it’s a recipe for riots, frankly. This art does not come from the streets but mainly from private schools, ‘creative industries’ who have clustered around Hoxton. It’s not a question of poor artists making good art that is then commodified by the rich art world – the artists know their commodified art world and so paint unchallenging, empty art to fit it, build their name and sell. They are not selling out as they never had any principles to sell in the first place. If you can illustrate interesting points to any of the artworks shown, I’d be grateful to hear it. 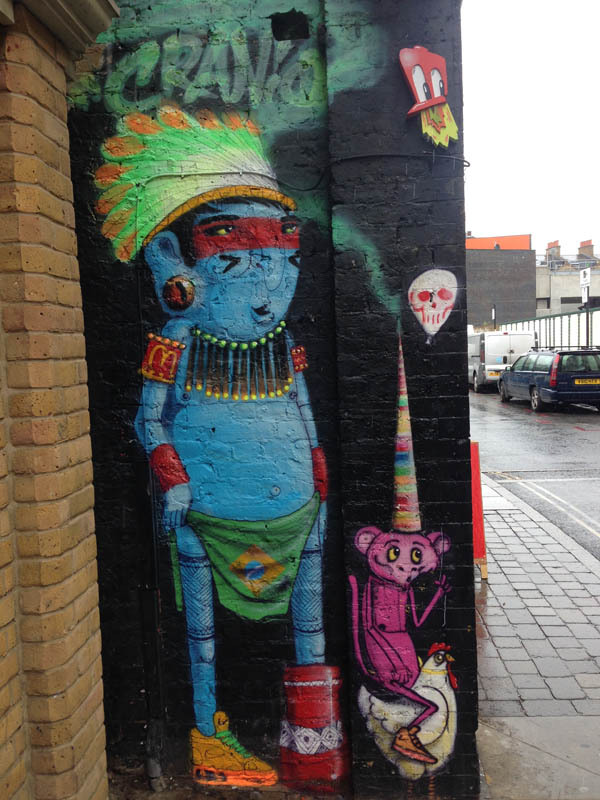 I welcome interesting and inclusive street artworks, like the Peace Mural and (funnily enough) the woman with kids sculpture at the top of Hoxton St which seems to have been municipal art from the 80s. (Not to everyone’s taste!). Art doesnt have to make a social point but if the only social points it makes are the negative ones above then I’m happy to see these vanity projects go. It’s worth being outraged over the criminal destruction of the Chartist mural in Newport, but not these symbols of gentrification. 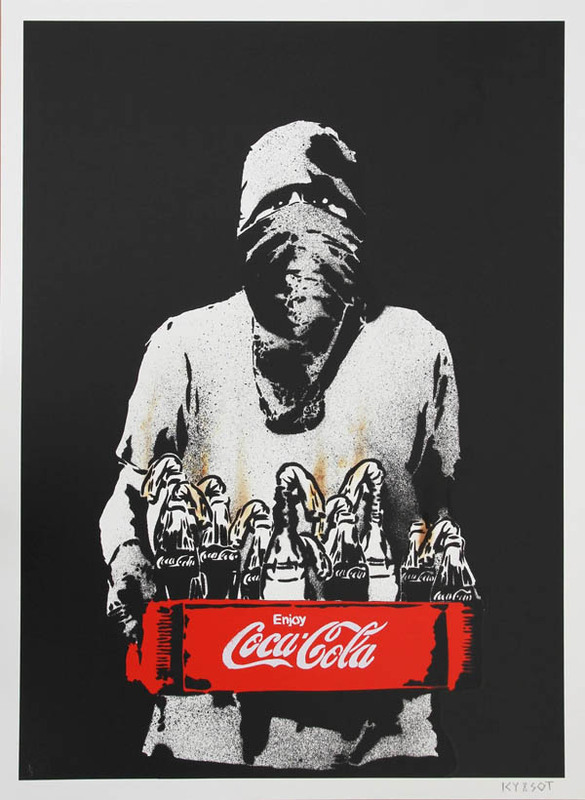 Banksy’s stuff is usually fabulous, I don’t care how much his art is worth! it makes lots of great points, some social, some just funny, or a combination. Cheers Paul – it’s good to have a bit of debate! We’ll post a reply a bit later. Anyone else who wants to chip in, please feel free to post comments here. I just wanted to respond to several of the points you make. 1) It’s undoubtedly true that working class people are being driven out of Hackney. They are the victims of fiscal cleansing. But it is important to recognise who the real enemy is: it’s not street artists – it’s the property speculators, landlords and estate agents who constantly put up the rents and buy up all the property up, that push the poor out of the borough. 2) Artists are also victims of this process. Many young artists settled in south Hackney and north Tower Hamlets long before the so called ‘gentrification’ took plave. They were able to hire studios for cheap rents and for street artists there was plenty of wasteland and empty buildings to paint their works on. As the rents have gone up most of them have been forced to move into cheaper areas. There are very few studios in Hoxton now. 3) Does it matter what class artists come from – surely all art should be judged on its own merits not what class background the artists comes from? On that basis we would reject the work of Rivera, Mayakovsky and Banksy, to name but a few. 4) Interestingly several of the street artists you dismiss come from very poor backgrounds – both Stik and John the Painter were homeless and Robbo was a cobbler before he died. 5) Many of these artists do not separate their work from the communities they live in. 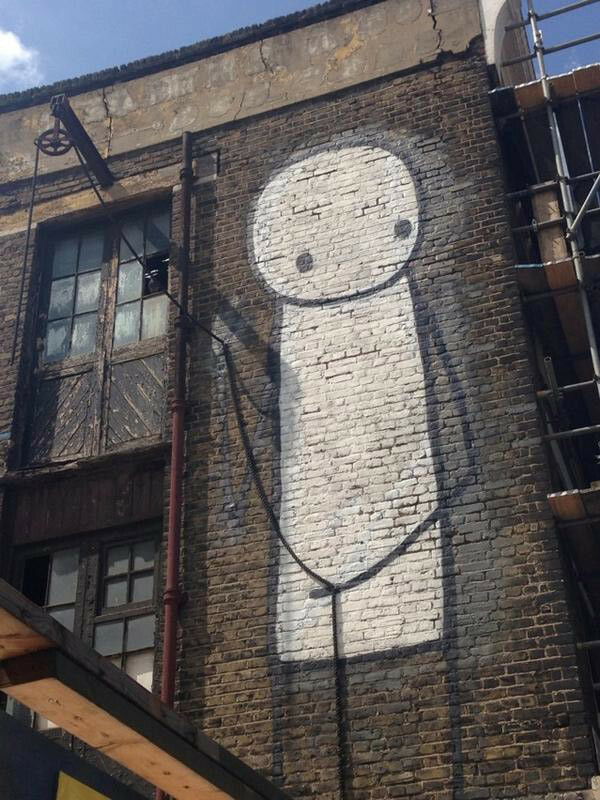 Stik has put his works up in local schools, playgrounds and a local mental heath and psychiatric hospital. Dscreet has painted the local skatepark and John the Painter is always giving his drawings away to local people. 6) I don’t accept your claim that this art makes no social comment. Below are some pictures of local art which contains political messages. I reject the notion that the only good art is political – I believe art should be judged on its own merits – its beauty, does it express something about the human condition, does it challenge your perceptions etc. 7) Lastly I do feel outrage at the the destruction of the Chartist mural in Newport, and you should be outraged at the knocking down of Leonard Street car park. You don’t have to like the art, but you have to be clear they aren’t knocking it down because they don’t like the works of Run, Rone and Stik. The site is being cleared to build more expensive flats and so do exactly what you hate. property prices up and fuelling this vicious spiral. Poorer artists might try to hang on living in what has become a ‘centre of the creative industries’ but with greater difficulty. So the changing class composition of this neighbourhood and the role of artists in this process, intentionally or not, does matter. However, I suppose artists have always had to wrestle with and reflect on the contradiction of the place of their art in the market, often bought or used by rich individuals. I’d like to see more art that is critical of the gentrification process rather than just prettifying it. I never claimed that the only good art is political art. Interestingly, you have subsequently posted on Facebook a number of photos of street art that I do find engaging and appealing for a variety of reasons, not usually as they’re political. Don’t get me wrong, for all its uses or abuses, public art is a good thing (even when I think a piece is bad!) But I do find most of the big pieces around Leonard St bland. 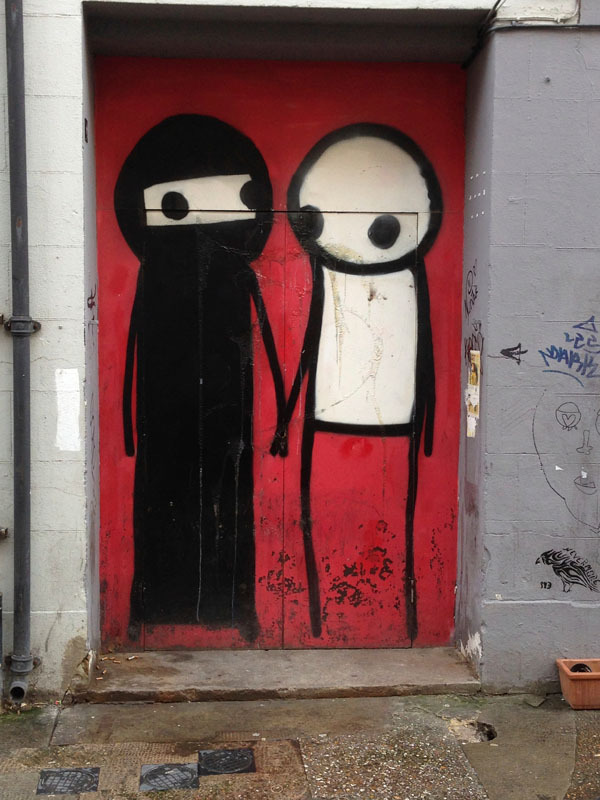 Interestingly I very much like Stik’s social message of Muslim-white friendship, and it’s a good example of art with a great social use, but I still find his style bland. I’m also irritated when an artist has a very limited style but feels it’s great to keep repeating it ad nauseam (SweetTooth comes to mind).